RED BULL HAS A NEW LINE OF ORGANIC SODAS! The new line, featuring ORGANICS by Red Bull Simply Cola, Bitter Lemon, Ginger Ale and Tonic Water, is a range of premium, organic sodas made with ingredients from natural sources. While these sodas come in the iconic Red Bull 8.4 fl oz-sized cans, they are not energy drinks, they are refreshments designed to complement meals, snacks and social outings. In fact, the only ORGANICS by Red Bull which contains caffeine is Simply Cola, with 32 mg of caffeine per can from organic coffee beans. For reference, an 8.4 fl oz Red Bull Energy Drink contains 80mg of caffeine, about the same amount as a home-brewed cup of coffee. 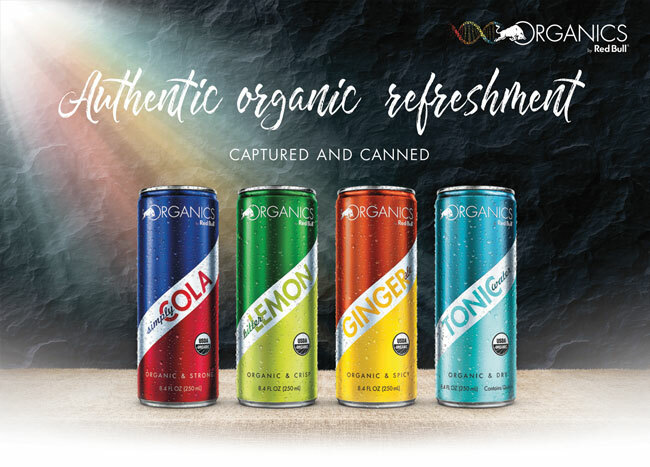 ORGANICS by Red Bull new line has been certified organic in compliance with the USDA National Organic program which stipulates that organic products may not contain artificial flavors, artificial colors, artificial preservatives or GMOs. The end result is four distinct, great tasting, and refreshing organic sodas made for your enjoyment, all with 100 calories or less per can! DISCOVER THE INGREDIENTS AND LEARN MORE!